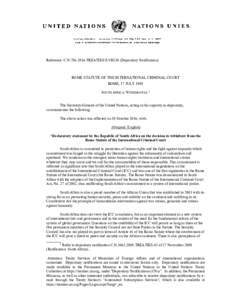 1 Rome Statute of the International Criminal Court, l July aooa, UN Doc A/CONF. 183/9 (2002). 2 Schabas , William A , The International Criminal Court: A Commentary on the Rome Statute ( Oxford : Oxford University Press , 2010 ).